For long, a group of agriculture scientists under the Society for Conservation of Nature (SCN) pondered over a question: How does the ever-increasing use of nitrogen-rich fertiliser impact the ecosystems? It is a sensitive issue given that India’s food self-sufficiency owes a lot to the use of urea that ensured high yields. But SCN, a coalition of more than 120 scientists with varied expertise, took a call to launch an in-depth scientific probe in 2006 with the setting up of a specialised group called the Indian Nitrogen Group (ING). They studied not just the nitrogen (N) being used for agricultural purposes but also its increasing emissions from the transport boom in the country. India as a country was using and emitting huge amount of nitrogen, and its related toxic components. After 10 years of intense studies, with-out any government help, SCN published the 568-page compilation of 30 review papers called The Indian Nitrogen Assessment, India’s first-ever such attempt. The Assessment encapsulates the complete journey of nitrogen in India from different emission sources to the various processes through which it escapes to the environment and the effects of the pollution that it causes. It also paves a way forward for minimising nitrogen pollution in India by cutting down its emission at the source. With the Assessment’s publication, India has become the third country/entity after the US and the European Union to have assessed the environmental impact of nitrogen on their respective regions comprehensively. The Assessment shows that agriculture is the main source of nitrogen pollution in India. Within agriculture, cereals pollute the most. Rice and wheat take up the maximum cropped area in India at 36.95 million hectares (ha) and 26.69 million ha respectively; India consumes 17 Mt (million tonnes) of nitrogen fertiliser annually as per the data of the Fertiliser Association of India. Only 33 per cent of the nitrogen that is applied to rice and wheat through fertilisers is taken up by the plants in the form of nitrates (NO3). This is called Nitrogen Use Efficiency or NUE. The remaining 67 per cent remains in the soil and seeps into the surrounding environment causing a cascade of environmental and health impacts. The Assessment found that nitrates not only affected surface water but also polluted groundwater sources. A study quoted in the Assessment found that in parts of Punjab, Haryana and western Uttar Pradesh the NO3 concentration in dug well water and shallow bore-well water had exceeded the limits prescribed by the World Health Organization (WHO) by several times. This was the worst in Haryana, where the average NO3 content in well water was 99.5 mg/litre while the WHO limit stands at 50 mg/litre. N pollution also has an effect on soil health which in turn brings down the yield of crops, becoming counterproductive to the very purpose of fertiliser usage. This happens because of the reduction of carbon content of the soil over a long period of time which affects its health. There needs to be a balance maintained in the application of fertilisers taking into account all the different nutrients. In a study, quoted in the report, in Ranchi, application of only nitrogen fertiliser reduced the carbon content of the soil by 28 per cent from the original level while application of nitrogen, phosphorus and potassium together reduced it by only 2.9 per cent. But the adverse effect of nitrogen is not limited only to water and soil pollution. Nitrogen in the form nitrous oxide (N2O) is also a greenhouse gas (GHG) and a fast rising contributor to global climate change. Fertilisers are the major emitters of N2O in India while vehicular pollution (55.53 Gigagram or Gg), industrial and domestic sewage (15.81 Gg) also contribute towards rise of the GHG in the atmosphere according to a 2007 study by the Indian Network for Climate Change Assessment. Yashpal Abrol, founder president and chief patron of SCN, told Down To Earth that “N2O is 300 times more potent as a greenhouse gas as opposed to CO2”. He adds, “While carbon has been debated upon extensively by the Inter-governmental Panel on Climate Change and under the United Nations Framework Convention on Climate Change, it is time for us to look at N2O and nitrogen pollution in general in a big way.” In comparison to 60 Gg in 1950, N2O from agriculture in India has risen to more than 300 Gg in 2010. In contrast, world emissions stood at 37,000 Gg as per a 2013 study by the International Nitrogen Initiative. Unfortunately for India, agriculture is just one of the sources of nitrogen pollution. N Raghuram, President of ING that prepared the Assessment, says, “Sewage and organic solid wastes form the second largest source of N pollution in India. While this may not be so in developed countries with better systems for sewage and solid waste management, including recovery of nutrients from them, it is one of the fastest growing sources of N pollution in India, at least four times faster than that of fertilisers.” He makes the case for recycling N from industrial and domestic sewage and using it for fertilisers in India. According to him 40 per cent of fertilisers can be saved by closing this cycle in the country. Vehicular pollution is also a major contributor of NOx, accounting for 32 per cent of the total emissions in India, out of which 28 per cent is from road transport. In Delhi, the share of road transport shoots up to the range of 66 to 74 per cent, according to the Assessment. The poultry industry in India growing at 6 per cent per year emitted N to the tune of 0.415 Mt in 2016, which will increase to 1.089 Mt by 2030 (see ‘How N pollution happens’,). Such an assessment is important considering that we have already breached the ªplanetary boundaryº for nitrogen—the limits of the earth within which humans can thrive. “The planetary boundary of N (nitrogen) is set at 44 Tg (Tera-grams) per year globally,” says William Steffen, emeritus professor of environment at Canberra’s Australian National University. “Current application of N, primarily through fertiliser usage, is about 150 Tg N per year, which is over three times greater than the planetary boundary and well outside of the uncertainty range,” he says. Based on its analysis, SCN advises policies for India to increase its NUE to reduce the impacts of nitrogen pollution on the environment, human health and climate change. A big reduction would be possible by controlling the use of fertilisers. For one, this would reduce the fertiliser subsidy burden on the Indian government. While other fertilisers were de-regulated by the government after the liberalisation of the economy in 1991, urea, which primarily contains nitrogen, remains completely regulated till date. In other words, the government controls the production, import and distribution of urea. 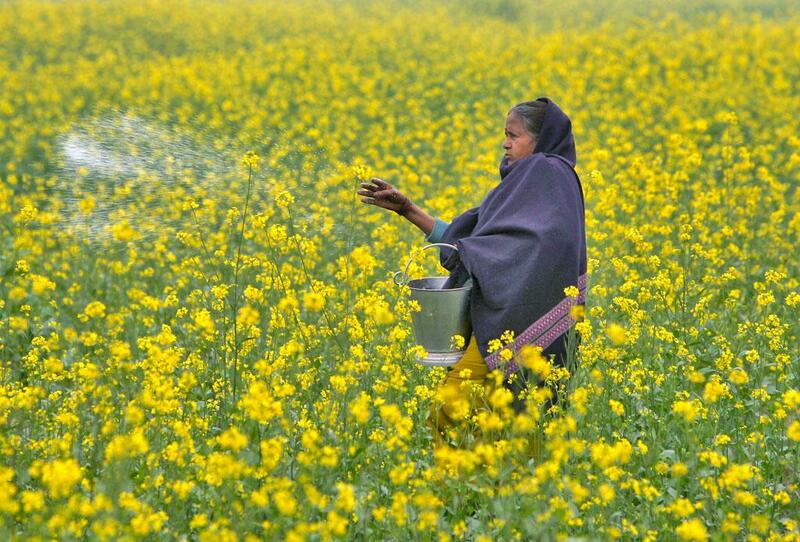 For India, the Assessment finds that based on a tentative selling price of US $78.8 per tonne of nitrogen fertiliser, a cash subsidy of around US $7 billion puts a heavy burden on the country’s exchequer. The report calculates that India loses nitrogen worth US $10 billion per year as fertiliser value, while the costs of N pollution on health ecosystems and climate are calculated at US$ 75 billion per year. It also finds that a relative improvement in current rates of NUE by 20 per cent would have net economic benefits of about US$ 170 billion per year globally. But can India balance its food security through increased use of fertilisers and the consequential N pollution? Experts say “yes”. 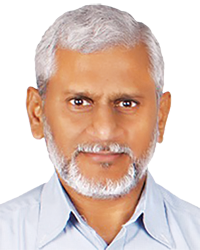 Raghuram cites that the production of food crops and the increase of fertiliser usage are not currently going hand-in-hand and this was because of other limiting factors. He says, “Continuing to increase fertiliser usage without addressing irrigation or other nutrients will be governed by the law of diminishing returns in terms of yield (see ‘Ensure need-based use of fertilisers’).” Steffen says, “We need to learn how to grow food with much less use of nitrogen (and phosphorus) fertilisation. One of the most prominent ways of doing this is so-called ªprecision agricultureº, which uses hi-tech approaches to apply just the right amount of nitrogen at just the right time for the plant’s needs. This eliminates an enormous amount of wastage without affecting yields, bringing global nitrogen application down towards or within the planetary boundary. But precision agriculture is only practiced in a few places and needs to become more widespread, he says. Mark Sutton of the International Nitrogen Initiative says, “Reducing the use of nitrogen fertilisers and increasing that of recycled manures offers the prospect for Indian farmers to produce food more securely and profitably, while saving the government a huge amount of money.” “At the same time, practices that save nitrogen and carbon in the system are closely coupled, so that better nitrogen management contributes to improved soil structure and resilience from drought, erosion and other climatic risks,” he adds. Sutton says that this provides India with a unique opportunity of a leadership role in terms of global nitrogen management. In fact, it is already doing so through ING that has published the Assessment and by leading the South Asian chapter of the International Nitrogen Initiative. Raghuram stresses upon this point. “Our report has demonstrated that we have all the scientific capacity needed to assess our reactive nitrogen loads, sources, sinks, flows and future scenarios, as well as identify possible interventions. If only we leverage this scientific and environmental soft power to tweak our environmental diplomacy with the changing times, geopolitics and economics, we can easily demonstrate our potential for global environmental leadership. We have little to lose and possibly a lot to gain.” In fact, the Indian government might have inadvertently taken certain steps like mandating neem-coated urea production which can abate a crisis. Neem-coated urea releases nitrogen at a slower pace giving plants time to absorb it, hence leading to an optimal usage. "Ensure need-based use of fertilisers"
How is India's nitrogen pollution different from that of the world? Nitrogen pollution differs from country to country, depending on the sources of contribution, which can be anything from agriculture, domestic and municipal sewage to fossil fuel burning, vehicles, industries and residue burning. The biggest human-made source of nitrogen pollution is unused fertiliser in the farms, whether chemical or biological in origin. In India, due to the unaffordability of precision agriculture or labour costs for frequent application of fertilisers in small doses, farmers apply fertilisers in fewer but larger doses. But since crops cannot use the fertilisers fully, they contribute to the reactive nitrogen pollution in India. Most of it comes from cereal cultivation, whereas in other countries, it may come mainly from horticultural crops or cash crops as in China, or even from forage crops and livestock or animal farming as in Europe. Africa has a negative balance of nitrogen, which means due to lack of sufficient fertiliser/manure, farmers in the continent are mining away whatever little nitrogen is left in the soil, causing soil degradation. Can we maintain a balance between the use of fertilisers to achieve food security and limiting nitrogen pollution? Yes. Firstly, India's foodgrain production is not growing at par with the increase in fertiliser consumption. In fact, the role of nitrogen in cereal production has fallen sharply in the last two decades. Continuous increase in fertiliser usage without addressing the limiting factors will only result in diminishing returns in terms of yield, besides imposing environmental costs. We need to rationalise the unbalanced usage of nitrogen fertilisers in irrigated areas that grow multiple crops in a year and ensure need-based usage of nitrogen fertilisers in all areas, even if it means a slight increase in its usage in rain-fed areas. But most importantly, we need to put the clamps on non-agricultural sources of nitrogen, which are spewing the pollution at a much faster rate. 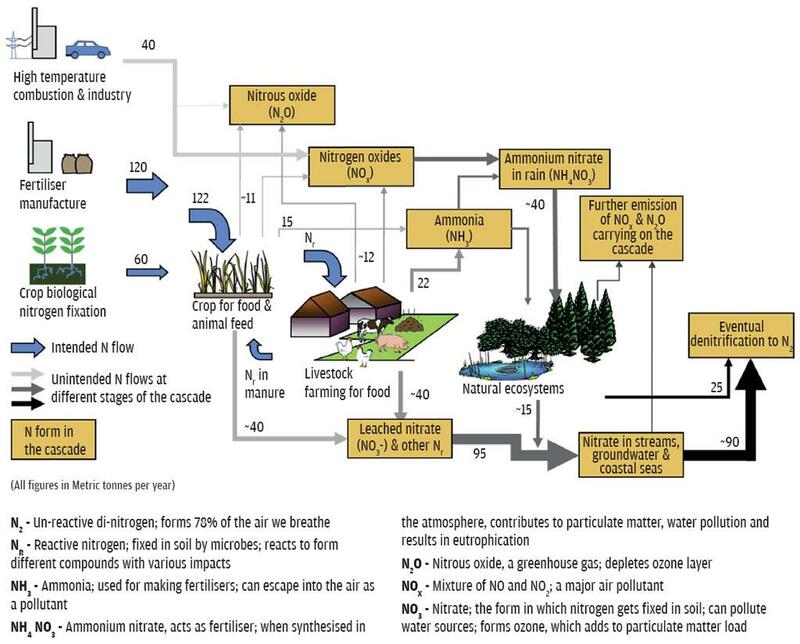 Can putting a check on agricultural sources of nitrogen pollution in India help in the restoration of the global nitrogen cycle? Considering the sheer size of India, Indian emissions, though much less than the US and China, contribute significantly to global averages and trend lines. Minor tinkering of our emissions may not impact global trends, but major interventions certainly can. For example, take two recent policy decisions: Mandating that neem-coated urea shall be the only source of urea in the retail market and reducing the pack-size of urea bag by 10 per cent. In a country that uses over 33 million tonnes of urea and whose agricultural fields release 3,00,000 tonnes of N2O, a greenhouse gas, the predicted reduction in emission due to neem coated urea and related measures could be as high as 1,00,000 tonnes per year! If this really happens, India's dent on global emissions will be huge. (This article was first published in the 1-15 December issue of Down To Earth, under the headline 'When N means noxious'). Today most fertilizers cause harmful effects on nature.It is a serious issues.Of course we need high yields but using huge amount fertilizer is very dangerous to ecosystem.People should be very aware of the fact that it can cause many disease.It is the high time we should find a solution to this.